Putin signed a decree on Thursday granting Russian citizenship to Depardieu, who objected to French Socialist president Francois Hollande's plan to impose the 75 percent tax rate. His decision to quit France had prompted accusations of national betrayal. The Russian president and Depardieu were shown on state-run Channel One shaking hands and hugging each other early on Sunday during what the Kremlin said was a private visit by the actor to Russia. "A brief meeting between the president and Depardieu took place," Kremlin spokesman Dmitry Peskov said. "On the occasion of his visit to Russia, he was handed a Russian passport." Peskov did not say whether Putin personally gave Depardieu the passport or if he picked it up through standard procedures. He said the actor also told Putin about his career plans. Depardieu, star of the movies "Cyrano de Bergerac" and "Green Card", is a popular figure in Russia, where he has appeared in many advertising campaigns, including for ketchup. He also worked there in 2011 on a film about the eccentric Russian monk Grigory Rasputin. Putin asked Depardieu whether he was pleased with his work in the movie, TV footage of their meeting showed, with the French actor saying he had already sent Putin some excerpts from it. 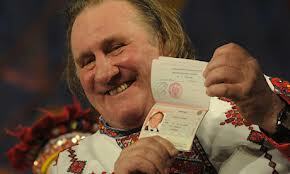 Depardieu bought a house in Belgium last year to avoid the French income tax increase. French Prime Minister Jean-Marc Ayrault called Depardieu's decision to seek Belgian residency "pathetic" and unpatriotic, prompting an angry response from the actor. Putin said last month that Depardieu would be welcome in Russia, which has a flat income tax rate of 13 percent, compared to the 75 percent on income over 1 million euros ($1.30 million) that Hollande wants to levy in France. He offered Depardieu a Russian passport, saying he had a close, special relationship with France and had developed warm ties with the actor, even though they had rarely met. Some of Putin's critics said the passport move was a stunt and pointed out that the president announced last month a campaign to prevent rich Russians keeping their money offshore.